Resident of Samaria who escaped a lynch mob on his way home from the supermarket recalls the moments of horror. A resident of Samaria who was attacked by an Arab lynch mob on his way home from grocery shopping was forced to open fire to defend himself Thursday, killing one of his attackers and wounding another. The man, a social worker and father of eight from the town of Itamar in Samaria, was on his way home from the Rami Levy supermarket in Shaar Binyamin, when he found himself under attack by an angry mob of some 200 Arabs. The attack took place along the stretch of Route 60 that passes through the village of Hawara, south of Shechem (Nablus). Hawara, which has expanded over the years up to the road’s edge, is the scene of frequent attacks on Jewish civilians driving through. 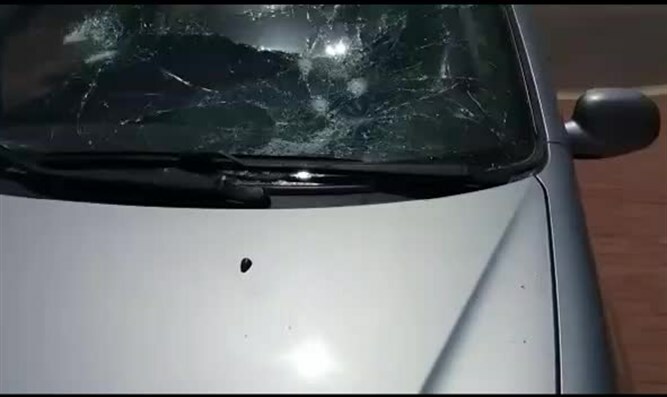 With the road blocked off during a riot on Route 60, the driver came under a barrage of stones as the rioters approached his car, forcing the driver to defend himself with his personal firearm. “I was on my way back from shopping at Rami Levy; the bags were in the car, when a violent demonstration began in the middle of Hawara,” the man said. One terrorist was killed when the driver opened fire on the approaching mob, and a second wounded. After the incident the driver was detained by police for questioning. After he was released, the driver filed a complaint of attempted murder at the police station in Ariel.